I just received this cookbook in the mail last week, and I really LOVE IT! 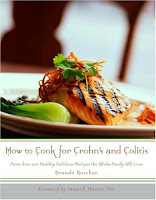 It is chock full of awesome recipes for people who suffer from Crohn's and Colitis, and for anyone else in general. Click on the link below for more information and read my bloggy pal, Anne's, terrific post! That's kind of a neat idea. I have a friend who's son has Crohn's and it seems like a dreadful disease to have to live with! Thanks for sharing the link! Crohn's Disease can be hard to live with, and diet really does make a difference! I was diagnosed with this disease when I was 19; it's the reason that I have an ostomy! How wonderful that there are books like this! Thanks for the info. Cool! A college friends daughter was just diagnosed with this. I'll check this out!